The High Resolution Stereo Camera on board ESA's Mars Express snapped a view of a curious cloud formation that appears regularly in the vicinity of the Arsia Mons volcano. 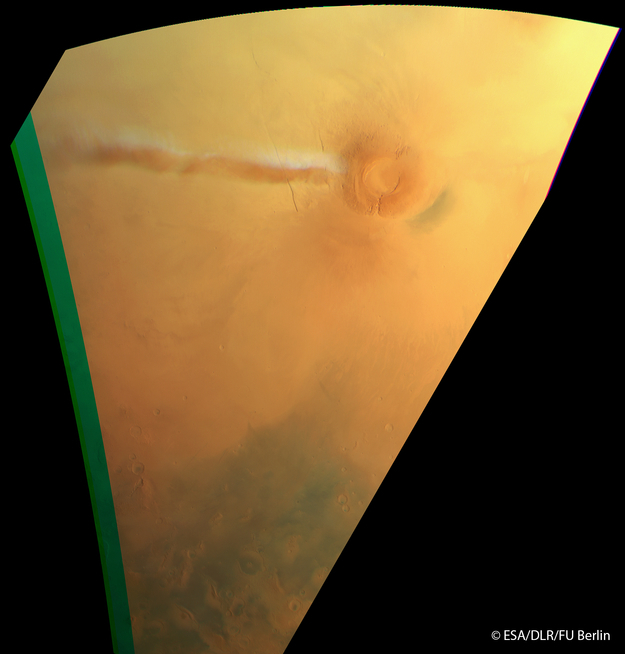 This water ice cloud, which arises as the volcano slope interacts with the air flow, can be seen as the long white feature extending to the lower right of the volcano. The cloud, which measures 915 km in this view, also casts a shadow on the surface. This image was taken on 21 September 2018 from an altitude of about 6930 km. North is up.